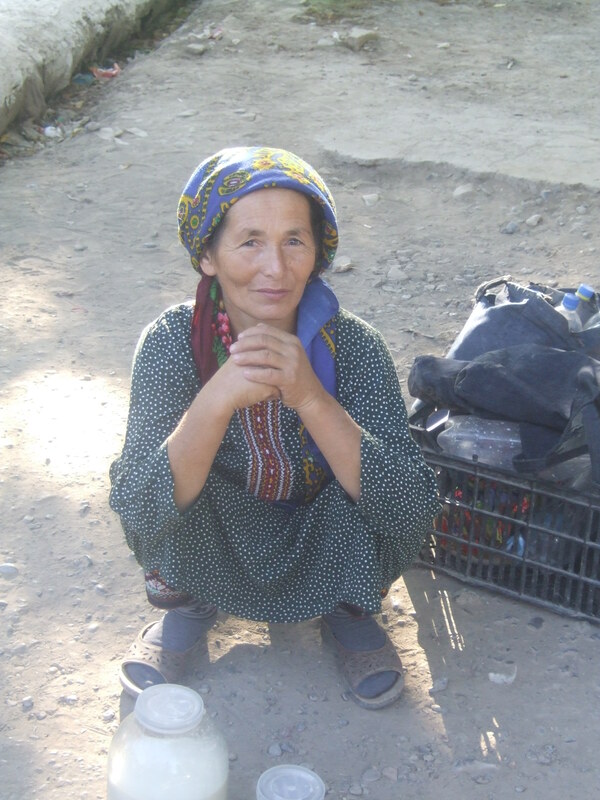 The Lonely Planet say that you are either insane or very unfortunate to visit Turkmenistan the hottest country in central Asia during July and August. The next 5 days will purely be cycling in a race against time to make the 460 km across the desert to Uzbekistan on a poultry transit visa. Knowing we had little time to spare., we arrived at the border early and were the first in line. When the border did open at 8:30 a.m. we were processed fairly quickly and surprisingly without too much hassle. Though we had one false start when we got 500 metres up the road and were informed we didn’t have the exit stamp and would have to go back. They were obviously playing with us and after going back were given the stamp. Arriving on the Turkmen side was a different story. We had to fill out some silly forms. The forms were in Turkish. We got scammed because we had to get one of the border guards to help us fill out the forms. For this we had to give him 10.00$US each on top of the normal 12.00$US processing fee which was on top of 85.00$US for the 5 day transit visa itself. To drag the whole thing out we had to take everything off the bike and put it through the x-ray machine and they don’t even bother looking. After clearing the border our introduction to the desert was brutal. The road was poor. The sun was very hot and the strong head wind was burning. The wind was so strong after a couple of hours and only 30 km we had to seek refuge in an abandoned farm. We slept there for about 4 hours before trying again. All afternoon I was dreaming of really cold water to drink. At 7 p.m. we had finally had enough for the day and pulled off the road camping behind some sand dunes. 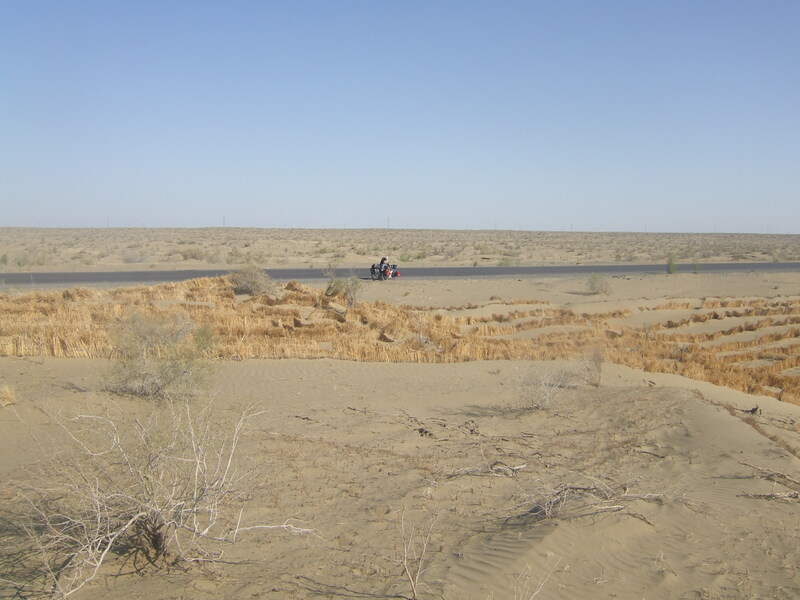 The road through the desert was long and straight with absolutely nothing for 50 km – 60 km. With the early start we made better progress today making 80 km by midday. We then stopped to get out of the 45°C heat and cooked up a hot meal for the day and then slept for the rest of the afternoon. We then started again at 4 p.m. to cycle another 3 hours and 40 km and just 40 km from Mary a reasonable size town built by the Russians. On the road all the local cars and trucks are Russian made. A lot of the freight trucks are old European trucks still with their branding. We only saw one shop in the whole day and were again dreaming of cold water. We camped about 500 metres back from the road in a cotton field. Its so hot I leave the fly off my tent. The night sky is so clear in the desert and every night you always see a few shooting stars. After one and a half days we had a short reprieve from the desert when we arrived in Mary. Stopped at a small shop and restocked the supplies……mostly water. 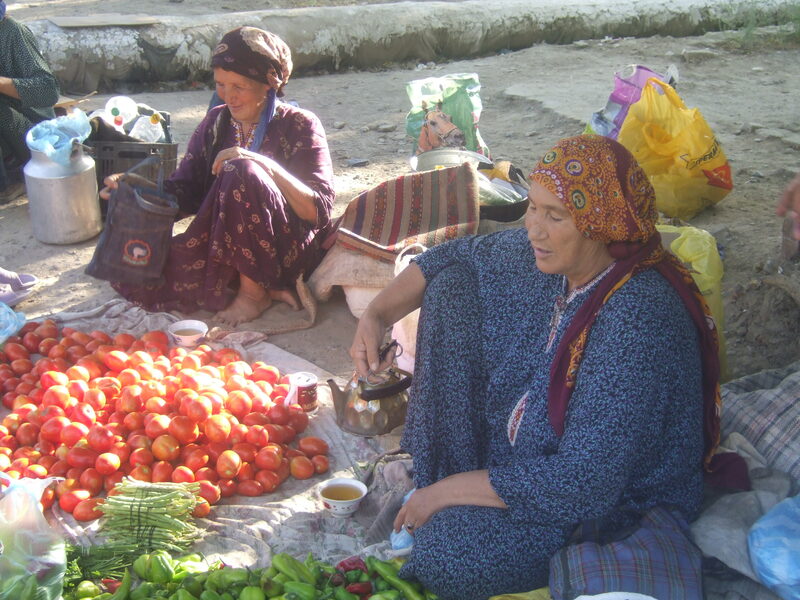 Behind the shop were a group of women selling produce from small mats on the ground. They kindly gave us some fruit to take with us. It was a shame that with our very tight scheulde we didn’t have a proper chance to cheek out the middle of town. From what we could see was lots of old style Russian houses. Cycling on we got our 80 km before midday and we were lucky to find some shade under some trees and that is where we spent the afternoon hiding from the sun. It is just too dangerous to cycle in the heat of the day………..you can feel yourself boiling. Not long after we started again. We had a British Ambulance pull up behind us. It was being driven by two guys Fred and Max who were taking it to Mongolia to donate to a hospital. They offered us a lift and it was very tempting………….but we declined. 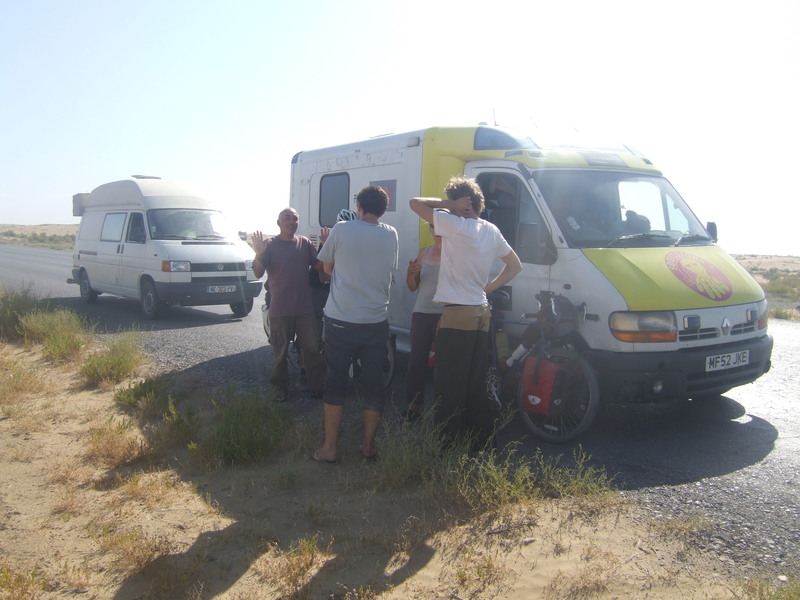 They were the first tourists I had seen on the road in months and definitely the only tourists in Turkmenistan. Then, bizarrely, a camper van pulled up with a French couple. We were all surprised to see each other. They kindly offered us food and water. 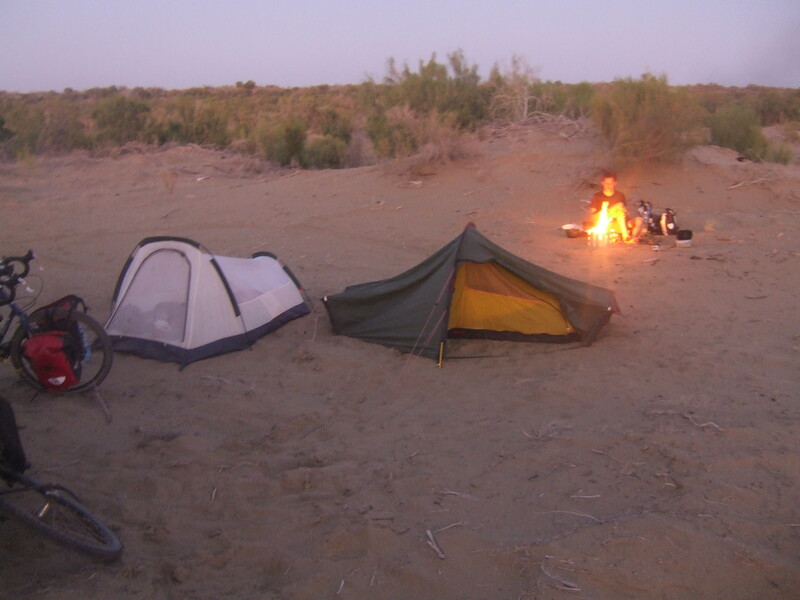 Camped again in the desert among the dunes only a short distance from the road. Again another perfectly clear night with many shooting stars. Desert, desert and more desert. We had pinned our hopes on getting more water at the desert research station shown on the map……………..when we got there, there was nothing. After that nothing else was shown on the map until Turkmenabat a further 80 km away. Not knowing where we were going to find water next was a little unnerving as we were getting low. We can carry 10 litres of water. But it doesn’t go far. When you’re thirsty you can down a 1.5 litre in less than 5 min. About 20 km on we found a small town. From one of the houses a guy sold us bread and water. But no more….Finding water was a relief. Mid-morning we saw the French couple again. With our early start we had overtaken them. Again they offered us some food and water. 2 hours later and in the middle of nowhere and no shade in sight it was a bit of a worry trying to find somewhere to stop and rest and more importantly hide from the sun. We were thinking of rigging up a small tarpaulin to get some shade. We were lucky we pushed on because 3 km along the way we came across a small building that looked like nothing from the outside. But was a restaurant. We were very thankful to find it. We had some lunch and then slept the rest of the afternoon in the restaurant . As 4pm came round, we reluctantly set off again. It was still very hot. 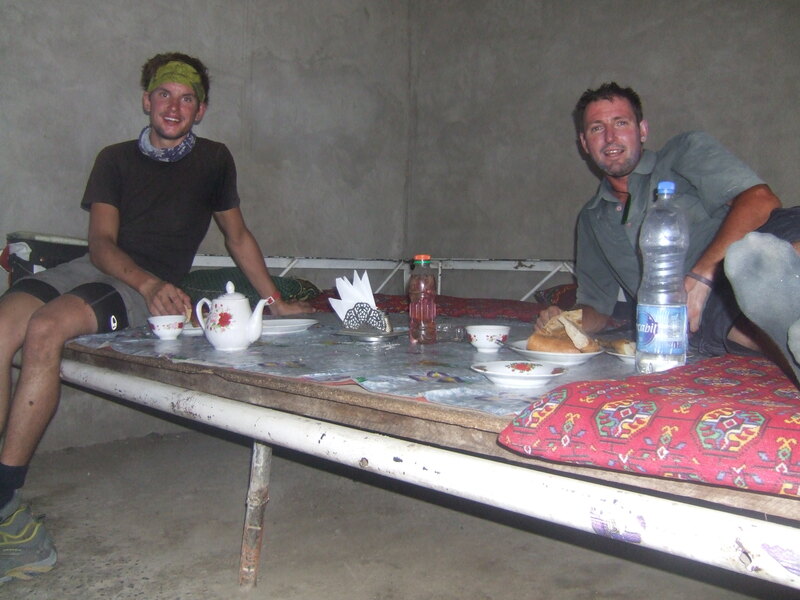 25 km from Turkmenabat and late in the day we came across another restaurant. Called in for some cold water. It was such a treat. They were hand making little meat filled pasta dishes and brought us out a plate to try. They had been fried and were very nice. Always very hungry at the end of the day. They went very quickly. I got the lot because Nino is a vegetarian. By the time we left the restaurant it was getting late so we basically only cycled another 3 km down the road before pulling off the road and camping the night among the sand dunes. 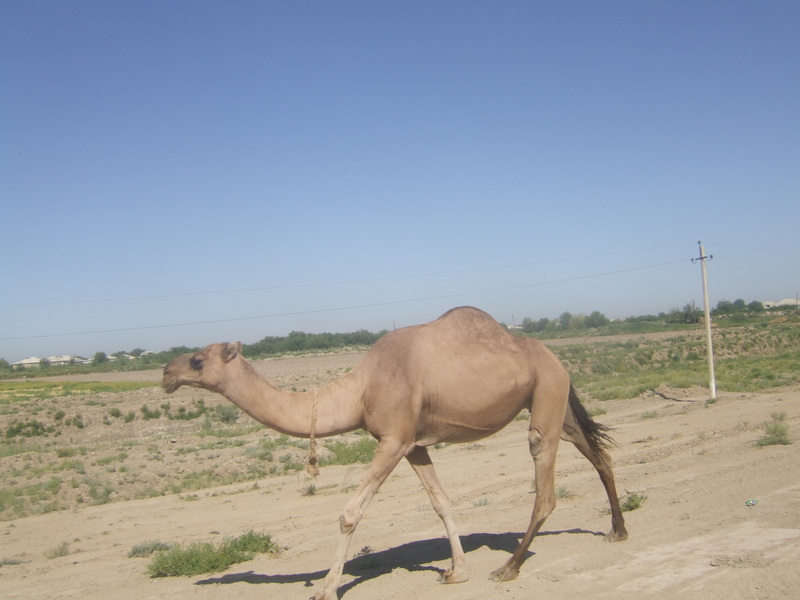 Just 25 km from Turkmenabat. The plan for this morning was to just get up and go. Motivation was treating ourselves to a big breakfast on our arrival in Turkmenabat. We didn’t even make it into the centre of the city. 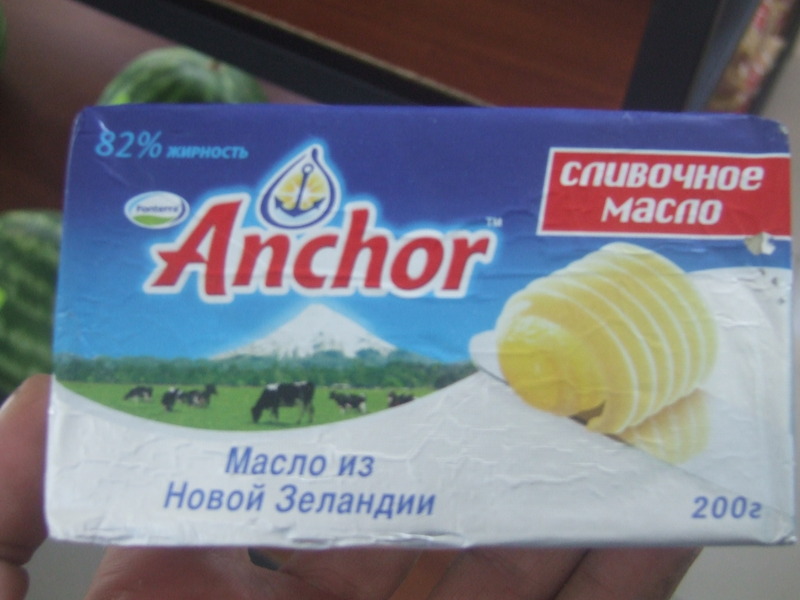 We stopped at the first shop we saw and spent all the Muants we had left on bread, Jam, crisps, juice, snicker bars, yoghurts and of all places I found butter from New Zealand. 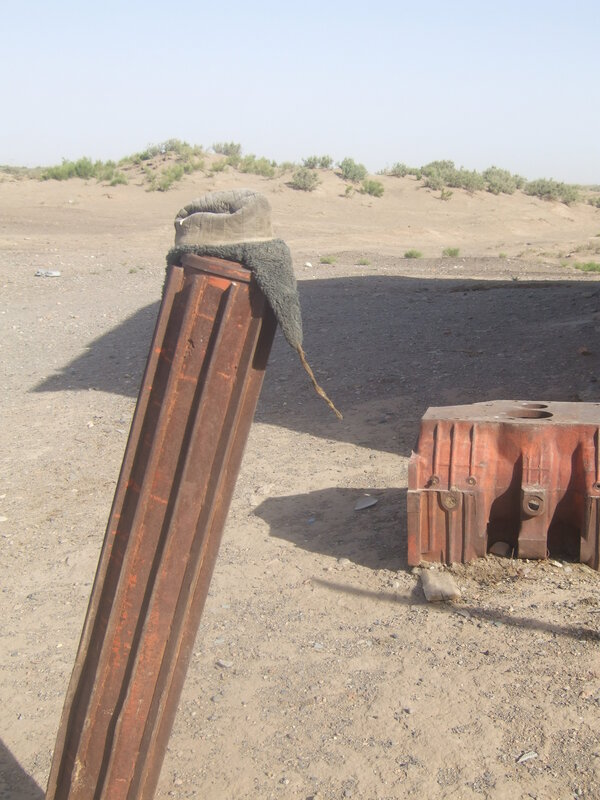 After our great breakfast we headed straight for the Uzbekistan border. It wasn’t easy to find. 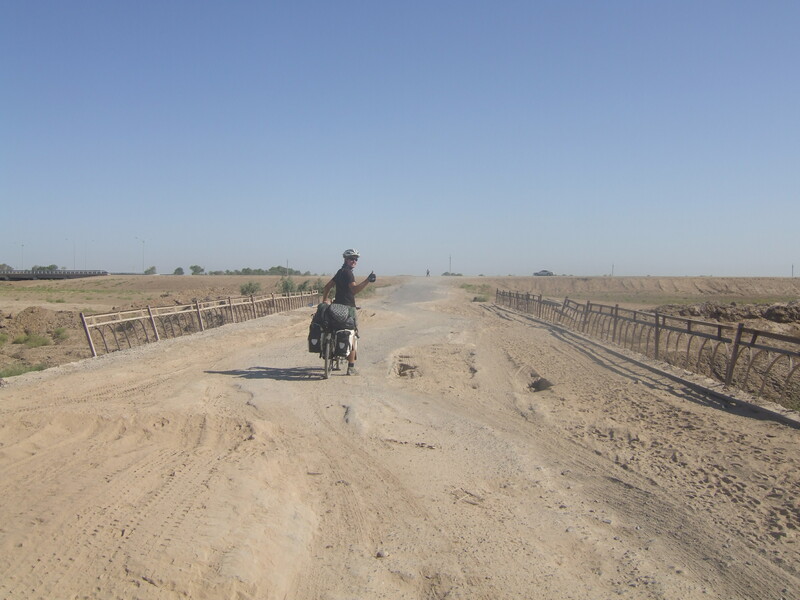 There hasn’t been a single sign to follow in the whole of Turkmenistan. So we had to rely on the map and local help. The road wasn’t even direct……..but many turns. When we finally arrived it was 1 p.m. and very hot. We decided our plan was going to get through the border and then call it quits for the day. Mission complete after 5 tough days. When we got up to the border gate it was closed. Gone for lunch back at 2 p.m. So we had to wait. There was a restaurant further back up the road. So we waited there. Returning to the border we got past the Turkmenistan control okay. Uzbekistan was a bit more difficult. Filling out forms and we again had to take everything off our bikes and put it through the x-ray machine. We even had a quick medical check with our temperatures taken. Getting out the other side was great. It really had been 5 very tough days battling the elements. We cycled about 10 km away from the border and then we crossed over the canal following a sandy track away from the road till we found some nice trees to camp under. That night we made a fire. but only got through our first course of tea and our second course of soup before the mozzies were so unbearable and we had to retire to the tent. Shame because it was so hot in the night even with the fly off the tent………..I couldn’t open the door because of the mozzies. where you’re now? nice to read wha’ happened, just keep riding, riding, riding! was great spending time with you guys in Esfahan and Yaz. The VIP bus to Teran was not so vip. Hope you had better luck hitching back to Germany from Turkey. Great to meet u in Katherine Gorge today Adam – what a fantastic adventure u are on! Always good to see people challenging themselves and exploring different places…there should be more of it.